Esko recently hosted the Flexible Packaging Honours Class, an initiative of the Graphical and Digital Media department of the Artevelde University College Ghent. The 3rd edition of this course took place from 19-30 June, at Esko’s headquarter offices in Ghent, Belgium. The two-week program focused on the production of flexible packaging, including design, prepress, file handling and plate making operations. “The flexible packaging market is a continuously growing segment in the graphic arts industry. We are honored to support educational institutes by facilitating comprehensive flexo prepress and platemaking training programs. As leaders in the packaging industry, our investment in education will help promote the future of flexible packaging, create enthusiasm and passion for the industry, and give young graduates an increased opportunity to find jobs as they begin their professional careers,” explained Jan De Roeck, director – solutions management at Esko. The training program is complemented by three Esko customer visits to demonstrate the reality of production. 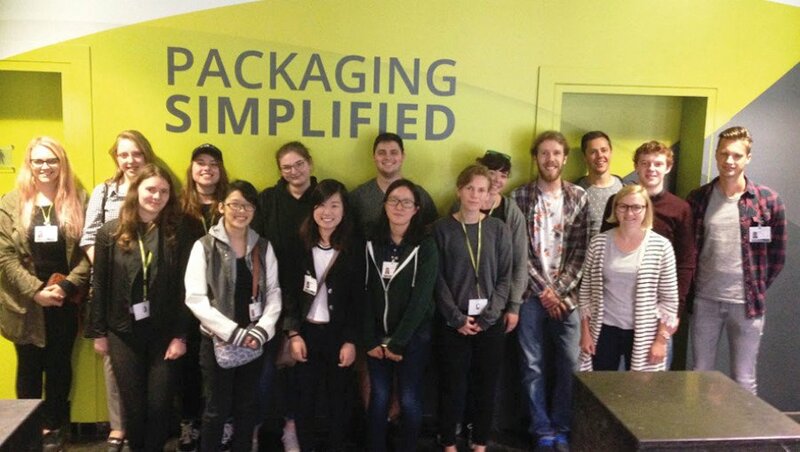 The 2017 Class had the opportunity to visit a label, shrink sleeve and small format flexible packaging converter (St-Luc labels & packaging in Nazareth), a wide format flexible packaging converter (Segers & Balcaen in Liedekerke), and a flexible packaging service provider and trade shop (Athena Graphics in Roeselare). At the end of the training, students received a certificate of participation, a valuable advantage when applying for a job in this sector. In some countries, students can also receive training credits by attending the Honours Class. The Arteveldehogeschool has opened the Honours Class to its educational partners from abroad, bringing peer-to-peer learning and exchange of best practices to an international level. The 2017 Class had the pleasure of welcoming students from the University of Ljubljana in Slovenia, Linköping University in Sweden, and both Seneca College and Ryerson University in Toronto, Canada. Students in the academic year prior to graduation are welcome to apply for one of the 20 Honours Class seats. To be accepted, students must have a mastery of Adobe Creative Suite applications and a general understanding of prepress production steps, processes, and functions. Students who are approved for the program will be invited to complete and submit preparatory work in order to fully prepare for the program.